You can order Canada passport, Canada Visa, Canada Immigration or Canada PR Card photos with us. Please note that these 4 types of photos have different requirements so please indicate the correct type and size on the payment. 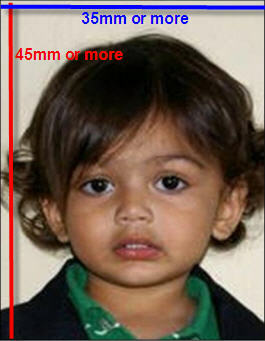 • The final frame size of the photo must be at least 35 mm x 45 mm (1 3/8" x 1 ¾"). • The photographs must show the full front view of the head, with the face in the middle of the photograph, and include the top of the shoulders. 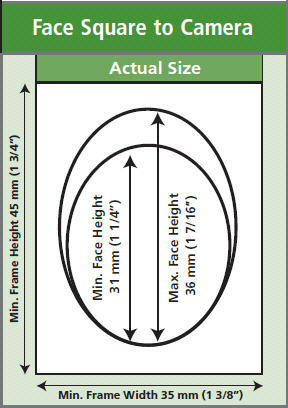 • The size of the head, from chin to crown, must be between 31 mm (1 ¼") and 36 mm (1 7/16"). • If an existing photo is being scanned, the minimum resolution must be 600 pixels per inch. File Format: The file may be submitted in JPEG or JPEG2000 format. File Size: The final size of the image should be ideally 240 kB (kilobytes), but not less than 60 kB. Color: The image must be in color (24 bits per pixel) in sRGB colour space which is the common output for most digital cameras. Canada Immigration photos are photos used with Canada Immigration, Permament Resident Card applications/renewals. Canada Visa photos are photos used for Canada Visitor Visa application, Canada Temporary Resident Visa, Canada Study Permit or Canada Work Permit. The face must be square to the camera with a neutral expression, neither frowning nor smiling, with the mouth closed. Provide two photographs of yourself and each accompanying family member with your application. Photographs must be printed on quality photographic paper. The photographs must be identical and taken within the last six months. They may be either black and white or color. The photographs must be clear, well defined and taken against a plain white or light-colored background. If the photographs are digital, they must not be altered in any way. Your face must be square to the camera with a neutral expression, neither frowning nor smiling, and with your mouth closed. You may wear non-tinted prescription glasses as long as your eyes are clearly visible. Make sure that the frame does not cover any part of your eyes. Sunglasses are not acceptable. The photographs must show the full front view of the head, with the face in the middle of the photograph, and include the top of the shoulders. Crown means the top of the head or (if obscured by hair or a head covering) where the top of the head or skull would be if it could be seen. If the photographs do not meet the specifications, you will have to provide new photographs before your application can be processed. bear the date the photo was taken (not the date the photo was printed) directly on the back of one print (stick on lablels are not acceptable).